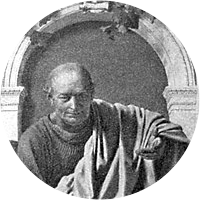 A collection of the best Horace quotations. A poem is like a painting. There is measure in all things. A fine judgment is discerning art. Wisdom at times is found in folly. Learn calm to face what's pressing. The more you get, the more you want. To know all things is not permitted. Whatever your advice, make it brief. Do you count your birthdays thankfully? To flee vice is the beginning of virtue. In giving advice I advise you, be short. Subdue your passion or it will subdue you. The Golden Age upon earth once more may live. What sorrow may not heal. Patience makes lighter what sorrow may not heal. Poets desire either to teach or to give pleasure. Ah, how they glide by, the years, the swift years! There are lessons to be learned from a stupid man. Lawyers are men who hire out their words and anger. He who has confidence in himself will lead the rest. One has half the deed done, who has made a beginning. Seize the day, trust the morrow as little as possible. Many blessings do the advancing years bring with them. Amuse the reader at the same time that you instruct him. He who has the confidence in himself will lead the rest. Remember when life's path is steep to keep your mind even. He who saves a man against his will as good as murders him. Laugh and the world laughs with you; weep and you weep alone. As riches grow, care follows, and a thirst for more and more. Seize now and here the hour that is, nor trust some later day! Rule your mind, which, if it is not your servant, is your master. Your own safety is at stake when your neighbor's house is in flame. If you would have me weep, you must first of all feel grief yourself. You may drive out nature with a pitchfork, but she will always return. You might drive out nature with a pitchfork, but she keeps coming back. Anger is momentary madness, so control your passion or it will control you. Anger is a momentary madness, so control your passion or it will control you. It is of no consequence of what parents a man is born, so he be a man of merit. They change their climate, not their disposition or soul, who run beyond the sea. The father's nature lurks, and lives anew. Money is a handmaiden if thou knowest how to use it; a mistress if thou knowest not. Even virtue followed beyond reason's rule may stamp the just man knave, the sage a fool. Lighten grief with hopes of a brighter morrow; temper joy, in fear of a change of fortune. Even-handed fate hath but one law for small and great: that ample urn holds all men's names. Drive Nature forth by force, she'll turn and rout the false refinements that would keep her out. To flee vice is the beginning of virtue, and to have got rid of folly is the beginning of wisdom. However rich or elevated we may be, a nameless something is always wanting to our imperfect fortune. Much will rise again that has long been buried, and much become submerged which is held in honor today. A heart well prepared for adversity in bad times hopes, and in good times fears for a change in fortune. Adversity has the effect of eliciting talents which in prosperous circumstances would have lain dormant. Adversity has the effect of eliciting talents which, in prosperous circumstances, would have lain dormant. It is sensible to dismiss the old horse in good time, lest, failing at the last, he makes the spectators laugh. Poetry is like painting: one piece takes your fancy if you stand close to it, another if you keep at some distance. You traverse the world in search of happiness, which is within the reach of every man; a contented mind confers all. Time will bring to light whatever is hidden; it will conceal and cover up what is now shining with the greatest splendor. Joys are not the property of the rich alone: nor has a man lived ill, who at his birth and at his death has passed unnoticed. Now learn what and how great benefits a temperate diet will bring along with it. In the first place, you will enjoy good health. A shoe that is too large is apt to trip one, and when too small, to pinch the feet. So it is with those whose fortune does not suit them.